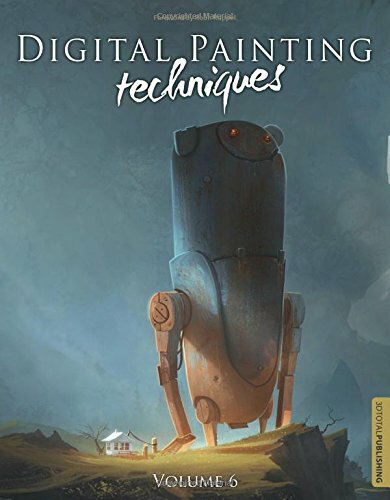 The Digital Painting Techniques series has been a tremendously helpful resource ever since it was released in 2009. With the sixth volume, I felt there's an increased emphasis on the fundamental of art, especially for the first four chapters. That's great because the fundamentals and thinking help to strengthen ideas instead of just relying on technical prowess. As usual, the book is filled with tutorials from top and experienced artists around the world. In the first chapter on concept art, Visual FX artist Alp Allen Altiner gives you the perspective of what it's like working in the digital art industry, and concept artist Markus Lovadina shows and explains how he creates concept art using thumbnails, creating character style sheets and speed painting. The second chapter deals with the creation of custom brushes. Third chapter is on speed painting, again the focus is on using basic art fundamentals like lighting, silhouette together with digital painting to come up with a successful concept. The next chapter looks at lighting and atmosphere at different time of the day under different conditions. The rest of the chapters are more subject matter-based covering characters, fantasy scenes and environments, sci-fi characters and landscapes. The last instructional chapters has three artists, namely Donglu Yu, Geoffrey Ernault and Markus Lovadina who walk you through the whole process of creating a particular piece of concept art from start to finish. It's always interesting to see someone else's process. There are lots to learn in terms of techniques and the thinking behind, to see how and understand the approach different artists take to tackle their projects. This is yet another insightful and inspiring addition to the Digital Painting Techniques series. Highly recommended for digital artists.